BOARDS READY, STEP 1, 2, 3 Better Scores..........Better Future! Stand Out for Residency! 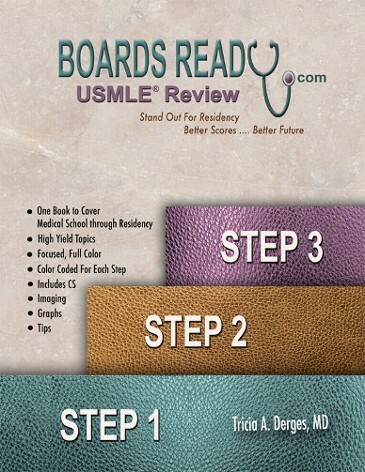 Boards Ready, Step 1, 2, 3 is the first medical textbook of its kind. Dr. Derges decided to go to medical school after spending a lifetime as the CEO and founder of a successful manufacturing company. During this route she was continually astounded at the lack of business thinking in the field of medicine. She states "In business, our goal is to streamline, simplify, and produce an excellent product: everytime, not just sometimes. I found medicine to be as far from this concept as it could get". She was frustrated at the number of excellent students that quit and gave up their life's dream of becoming a doctor because of the foolish mentality of many medical school professors and preceptors that believed that because "it was hard on them, they would make it hard on others". She found very little organization and consistency in the way many classes were taught and books were written. These are the very reason that Dr. Derges teaches in her own unique style. She believes it makes far more sense to provide a simplified, solid understanding of a difficult principal and then build upon this. She is old fashioned in her teaching: her classes are very interactive and visual - no lecures and powerpoints. This method has proven to be very successful. Dr. Derges is regularly asked by her students "What would you change about your medical path if you had to start all over again". Her response: "the greatest help would have been to have had ONE, organized book that focused specifically on high yield information for all 3 Steps so I could have seen the whole picture from the first day of medical school through residency and Step 3. I hated having different books only allowing me to see a small part of the picture as I went. This is why I teach my Step 1 classes backwards from Step 3. When my students see the whole picture, things become very clear for them". Dr. Derges spent 2 1/2 years creating and organizing a book that would serve this purpose. During this time, she has taught her classes from her book. 100% of every student that has used her book has returned from their Step exam and said "the book is "dead on". 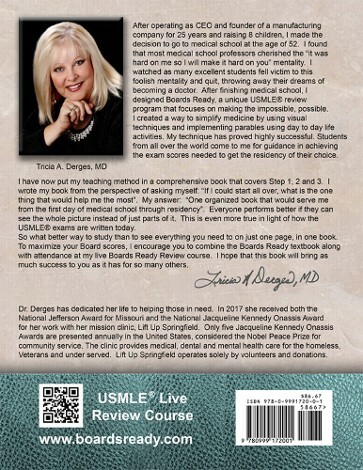 Dr. Derges book is now available to help medical students and doctors study for their USMLE Step exams. The beauty of her book is that a medical student can use this book from day 1 of medical school and carry it through Step 3 in Residency. No need for multiple books. See the "whole" picture. This 1125 page textbook is extremely organized, user friendly and color coded for each Step. It is a fabulous companion for all medical school classes - it allows the student to see where heavy additional study is warranted. This insures students will be preparing for their Step as they go through school and not just during the couple of months prior to their exam! Boards Ready can be ordered on AMAZON. We greatly appreciate a 5-star review on Amazon!